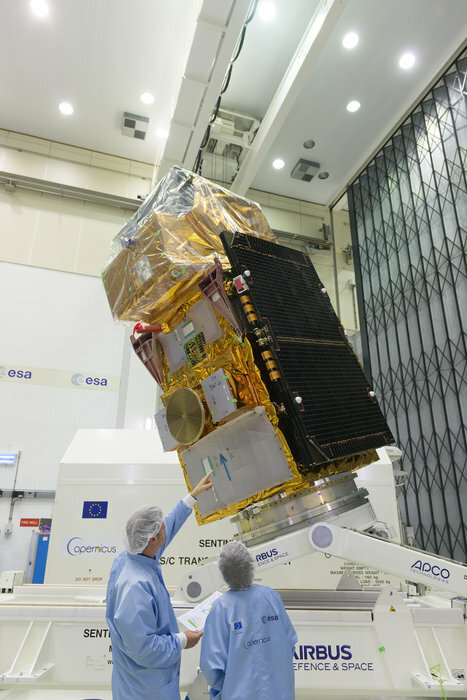 Just weeks before Sentinel-2B is packed up and sent to French Guiana for its launch next March, media representatives and specialists got one last look at the second satellite for Europe’s Copernicus programme. At an event held at ESA’s site in the Netherlands – where the satellite has been undergoing testing since June – ESA and Airbus Defence and Space project managers gave journalists an overview of how the satellite was built and tested, and its numerous benefits. “It’s a European satellite, built by more than 60 contractors from 15 countries,” noted Michael Menking from Airbus, the prime contractor leading the industrial consortium. Twenty-nine of the companies were small- or medium-sized. Offering ‘colour vision’ for Europe’s environmental monitoring Copernicus programme, Sentinel-2 combines high-resolution and novel multispectral capabilities to monitor Earth’s changing lands in unprecedented detail and accuracy.